Send your deepest care and concern during times of sorrow with our precious purple and lavender sympathy arrangement. The freshest roses, stock and waxflower, accented with fresh greens are hand-designed as a gesture of comfort and peace. 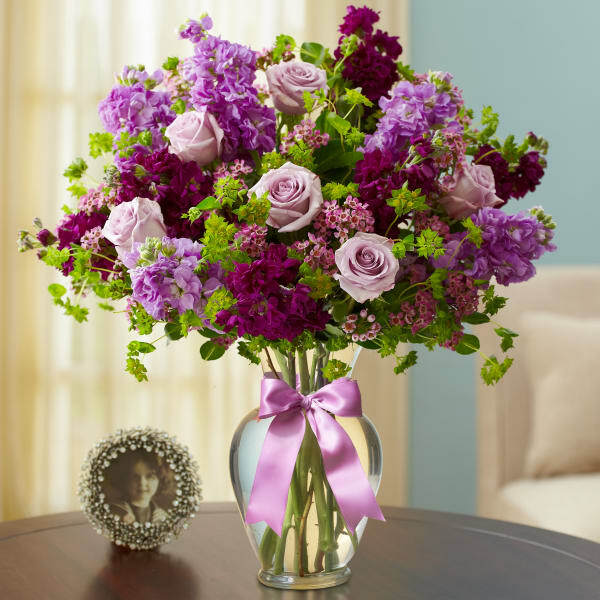 • Lush arrangement of long-stem lavender roses, purple and lavender stock, purple waxflower and bupleurum. 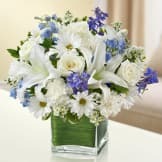 • Artistically hand-designed in a clear glass vase with a stylish decorative ribbon; measures 11"H.
Flowers will be received by a Thompson Funeral Home's staff. All of our flowers are designed and delivered by hand from a local florist in in Piedmont.